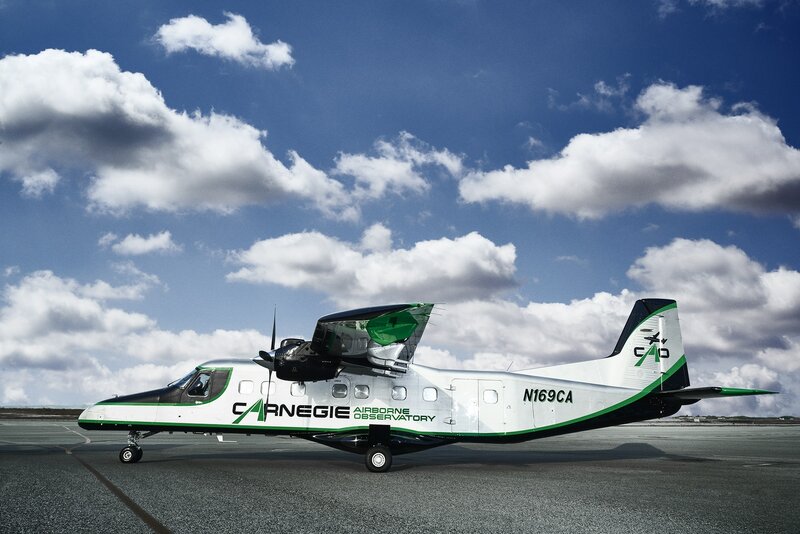 The Carnegie Airborne Observatory (CAO) was developed by Greg Asner with the mission to make scientific discoveries, support conservation, and galvanize action to protect the environment at large geographic scales. Now in its third generation, the CAO is a complete airborne laboratory based on a highly modified Dornier 228-202 aircraft, and it carries what is widely regarded as the most advanced mapping technology operating in the civil sector today. The most recent and technologically advanced instrument and computing package for CAO is called AToMS, or Airborne Taxonomic Mapping System. AToMS has four integrated sensing technologies: (i) High Fidelity Visible-Shortwave Infrared (VSWIR) Imaging Spectrometer; (ii) Dual-laser, waveform Light Detection and Ranging (wLiDAR) Scanner, (iii) High-resolution Visible-to-Near Infrared (VNIR) Imaging Spectrometer, and (iv) High-resolution Digital Imaging Camera. AToMS is now in its fourth generation configuration, with advances in all sensors. It can map features on the Earth’s surface in three dimensions, including all terrestrial ecosystems and the human-built environment. AToMS can also image coral reefs and other aquatic habitats with spectral detail. With a global range, the CAO has operated on three or more continents within a given year. It has mapped a variety of ecosystems and been deployed in the following countries: Belize, Borneo, Colombia, Costa Rica, Dominican Republic, Ecuador, Madagascar, Mexico, Panama, Peru, South Africa, USA (California, Hawaii, and St. Croix, USVI). Some of the most recent work has included mapping the spread of a fungus that is killing a native keystone tree on the Big Island of Hawaii and mapping the coral reefs of the Dominican Republic to inform the creation of a new marine protected area. Read more about the CAO’s projects on our blog page and more about our coral reef work on the Reefscape site.